Macau is a travel destination that people love it or hate it. Before we venture ourselves in this tiny part of China, we heard mixed opinions: “it’s all casinos” or “I love the casinos”. 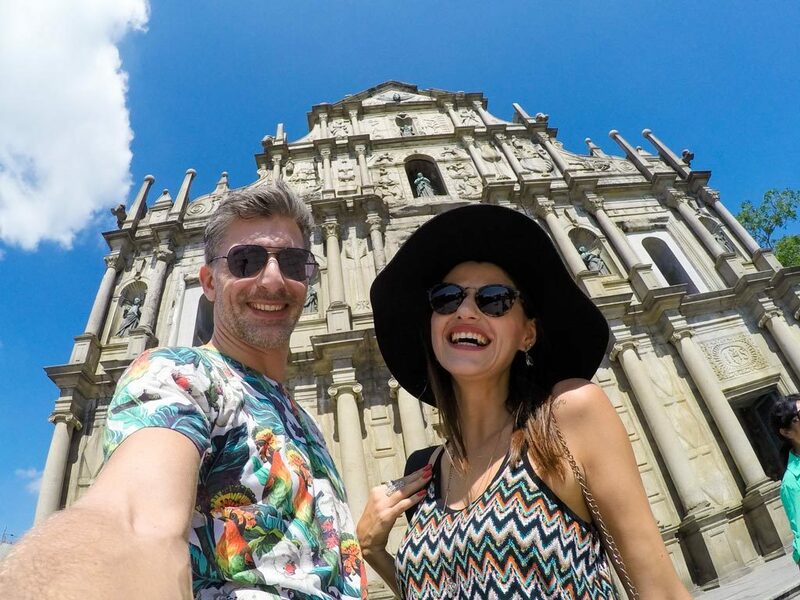 We were really excited and curious to explore Macau tourist spots, visit the attractions, and of course, try our luck at the casinos… After three days in the Chino-Portuguese town here is what we think about Macau, and why you should travel there too. Before we talk about things to do in Macau, attractions and where to stay, let’s talk about Macau history and why it’s such an interesting part of the world. If you don’t know yet, Macau is an autonomous territory located in the southeast of China, with its own flag, currency and offers free visa on arrival for more than 70 countries [check the Macau Visa Requirements and Policies here]. This open economy and free tourist flow is the result of 500 years of Portuguese colonization. On the 16 century Portugal rented Macau territory from China and stabilized there are profitable port and colony. On 20th of December 1999, Macau was transferred back to China, it was the end of the last remaining European colony in Asia and the beginning of the one country, two system policy in China. Done with historical facts! What you really need to know it that the mix of Portuguese and Chinese culture resulted in a very interesting city, a beautiful architecture, unique flavours and a gambling paradise. And it’s better to visit Macau before 2049, when the agreement of autonomy will end and Macau might became a completely Chinese territory. So know that you know why Macau is so unique, the history behind this tiny country and the time frame you have to visit, let’s talk about travel planning and what to do in Macau. First things first! How to travel to Macau? The answer is easy, you can get there by plane or boat. And depending on where you are coming, you might need to combine them. Macau has a busy airport, use Kiwi and Skyscanner websites to search for the best airfare and connections from your home country to there. Another common route is to travel from Hong Kong to Macau by ferry [Read our Hong Kong Travel Itinerary here]. There are many companies operating boats between the two cities, we used Cotai Waterjet to get from Hong Kong International Airport to Macau Taipa ferry terminal. If you land in Hong Kong and want to go straight to Macau this is a super fast and easy route. After the baggage claim you follow the information signs and go to the ferry ticket booth and from there to the pier. There is no need to pass by the Hong Kong’s immigration, you just gonna have your passport checked once you dock in Macau. If you are already in Hong Kong Island, enjoying this super modern and contrasting city, check the ferry website to see which pier and route are closer to the place you are staying. If you want to experience something different and more private, you can go from Hong Kong to Macau by helicopter. The quick flight [from 15 to 20 minutes] can cost up to HKD$ 300 per person. An expensive and scenic route to Macau. Where to Stay in Macau? Which are Best Hotels in Macau? We can roughly divide Macau in four areas: the old town, Taipa, Cotai and Coloane. There are hotels to stay in all these areas and depending which type of experience you want to have you can choose the best match for you. To be honest, Macau is not a budget destination, the city’s state of the art resorts and casinos can hit your pocket heavily. 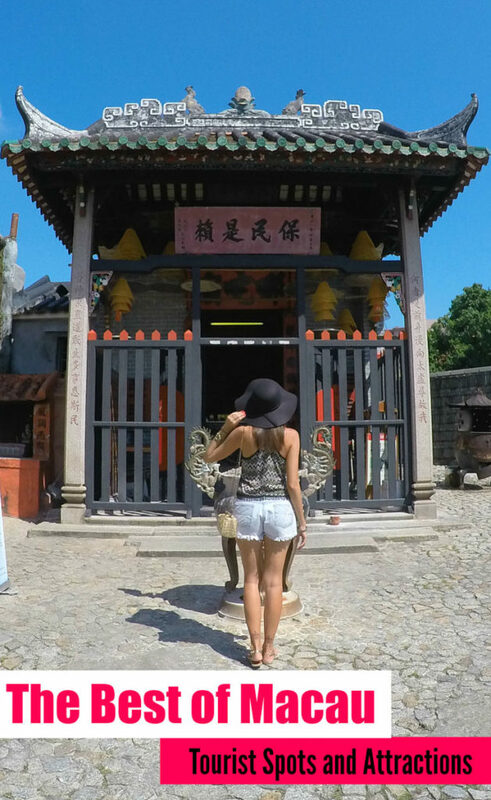 We travel to Macau to relax and enjoy, a balance of sightseeing and hotel moments. If you are looking for the same experience you should stay in Macau Cotai area, in the middle of the casinos and the best hotels in Macau. We spent two nights at Sheraton Grand Macao and love it!! The hotel is located at the Cotai Strip where you can find all the new casinos, shopping malls and international restaurants. After a long day exploring Macau tourist spots, you need to stay in a hotel where everything is within walking distance, from food to spa massages. What we loved about Sheraton is the mix of resort amenities as huge swimming pool, a delicious variety of cafes and restaurants, the casino [of course], with personalized and exclusive services. For our romantic trip to Macau nothing less than the Executive Suite at Sheraton Grand Macao. The room was divine, the bed super comfy, and wine & bath a well deserved a treat. Check all hotels rooms, prices and make your booking at Sheraton Grand Macao here! Not sure if this is the best hotel in Macau for you? So keep searching, we use Agoda to book hotels in Asia, most of the time they have the best rates. If you are looking for a cheap hotel in Macau it’s better to focus your research on the old and historic town of Macau. Here are some suggestions of budget friendly hotels in Macau we found for you. Now that you know how to get to Macau and where to stay, let’s talk about the top attractions in town. Macau tourist spots are concentrated at the historic town, bear in mind this is a tiny city with a huge population, so to get around is not that easy. Because of this, and also to understand the history behind Macau attractions we did a tour and no regrets! We are big fans of Buffalo Tours [if you read our posts about Vietnam and Thailand you already know we have toured with them a lot] and this time we decided to do Macau in a Day Tour. 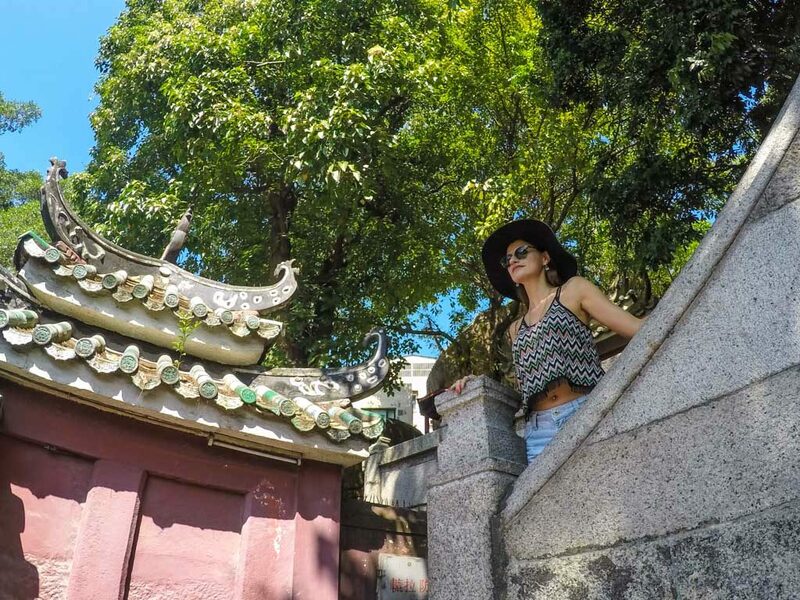 In one day we covered all the main tourist spots in Macau, visit historical places, try delicious food and even better, we had a super funny guide that helped us to appreciate the beautiful mix of Portuguese and Chinese heritage. The tourist attractions we gonna list here you can visit by yourself, but I highly recommend you go on a guided tour. It will make your life easy, especially if you don’t speak Cantonese Chinese nor Portuguese. 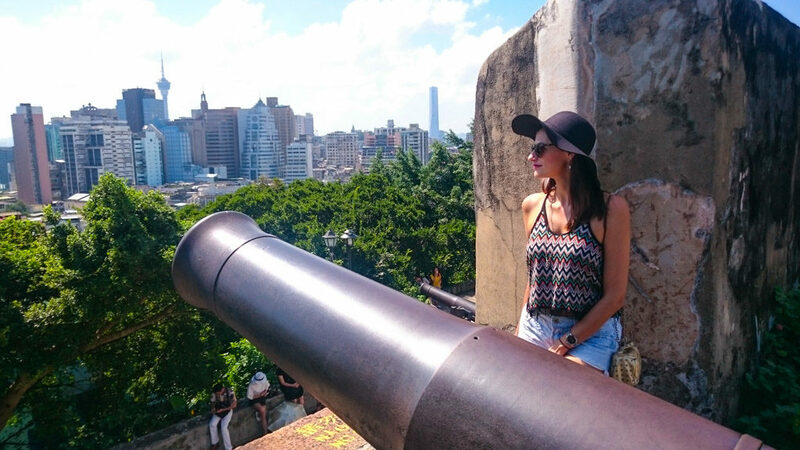 Among the historical sites, one unmissable thing to do in Macau is to visit the Mount Fortress. The Fort was built between 1617 to 1626 as a safeguard to protect the city, but nowadays it’s a beautiful garden and one of the best spots to appreciate the city’s skyline. The Museum of Macau is located inside the Mount Fortress with exhibitions that reflect the heritage, mix of culture and people that made Macau such an important city. When I think about Macau attractions the first image that comes to my mind is the facade of St. Paul’s Church. The history of it dates back to 1950s, built with white stones the church caught fire multiple times and only the front wall remained. This ancient ruin is an important part of the city’s history, one of Macau tourist spot adjacent to the famous Mount Fortress and Macau Museum. From the beautifully constructed church now we can only see the front facade of St Paul and the grand stone stairs. 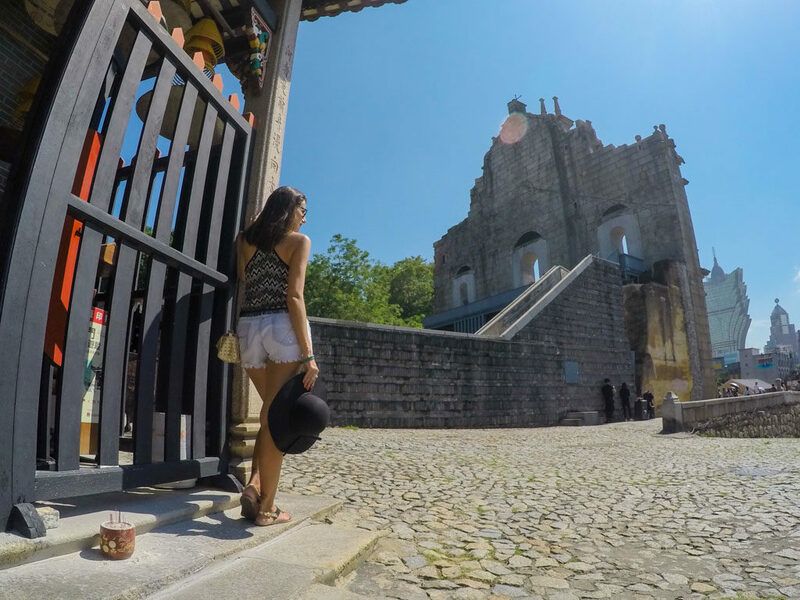 Another place to visit in Macau is the Old City Walls, the ruins are located between the St. Paul’s Church and Na Tcha Temple, a cute Chinese Buddhist temple, that is worth to visit too. The wall reflect the military defensive network of Macau. Macau has many temples, but A-Ma Temple deserves an especial attention as it one of the oldest Taoist temples in Macau. It dates back to 1948 and is one of the most historical places to visit in Macau. The temple has six important parts: Gate Pavilion, the Memorial Arch, the Prayer Hall, the Hall of Benevolence, the Hall of Guanyin, Zhengjiao Chanlin – Buddhist Pavilion. Venture yourself through the stairs, climb the rocks and at the top of you will find trees, incenses and offers. The temple is not only a tourist attraction in Macau, it’s a place of worship so be respectful while visiting it. Macau tourist spots also include Senado Square, a place that looks like Europe. Go for a walk around the square and be surprised by the colonial architecture and church. The elongated triangular shaped square connects Largo do São Domingos at one end and Avenida de Almeida Ribeiro on the other. Perfect spot for rest, enjoy the scenery and snap some cool photos. 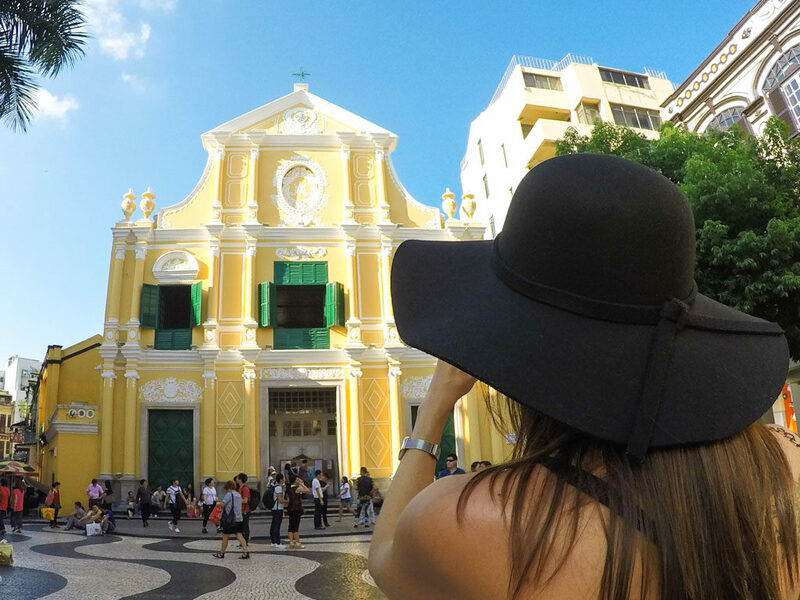 The Senado Square is in the heart of Macau, the streets that lead to the square are packed with cars, motorbikes and people trying to make they way across the city, or are shopping at the infinite amount of jewelry shops lined up on the road. Tired of historical and tourist attractions? Here is a suggestion of what to do in Macau that will give you goosebumps. Macau Tower Convention & Entertainment Centre, also known as Macau Tower, is the place to go if you are looking for adventure and adrenaline. What about jumping from the top of the Macau Tower? I’m not joking, the 233 meters highest bungy jump set the Guinness World Record for the highest commercial bungy jump in the world. And you can do it, literally in a blink of an eye. The jumping wasn’t included in the tour, what was fine as Rob and I wasn’t mentally prepared for that. Our trip to Macau was more about relaxing. The tour pass by the tower and if you want you can stay there for bungee jump or to enjoy the theatres, shopping malls and restaurants inside the tower. One more recommended thing to do in Macau is to visit the Casino Lisboa, the impressive building in the heart of Macau is one of the first casinos in the island. Its unique shape attracts tons of tourist every day, not only for gambling but actually to walk around and appreciate the décor. I can’t give you much info about the Casino Lisboa and how it looks inside, because instead of visiting it, we asked our guide to stay longer at the Senado Square. Our motto was: sightseeing during the day and gaming at night! Casinos in Macao, where to play? A little far from the historic old city you can find a world of luxury, shining machines, a lake with Venetian boats and even an Eiffel Tower [a copycat]. Welcome to Cotai Strip the place where the glitz and lights make you think everything is possible. The casinos are open 24 hours and people from all around the world [but especially from China] come to try their luck. Some of the famous casinos are Wynn Macau, The Venetian Macau, The Parisian, Studio City Macau and Galaxy Macau. These are the huge casino resorts, but all the hotels at the avenue have their own casino, so doesn’t matter where you are staying, you can always play. We are not big players, and I hate to lose money, so we gambled only one night. We did a casino hopping, starting by The Venetian, the Sands Casino at Conrad Hotel and the casino at Sheraton Grand Macau. The good news is that we doubled our investments, not that we have bet a lot, but enough to have fun! Where to eat in Macau and what to eat! One of the most important things to do while traveling is to enrich the taste buds with delicious food and traditional cuisine. In Macau you will find in every corner a restaurant selling local recipes, an interesting mix of Portuguese and Chinese dishes. The most famous and delicious foods of Macau are Portuguese egg tarts, pork chop buns which are simple yet satisfying, Serradura dessert, almond cookies, sweet pork jerky and an infinite amount of seafood dishes. Before ordering a meal, check out the reviews of the best restaurants in Macau. During our tour we had lunch in a traditional hotel with a lovely buffet, a true mix of flavors. Rob and I were in heaven as the Portuguese food reminds a lot the Brazilian flavors, so we enjoyed a little taste of home while savoring grilled sardines and spring rolls [such an unusual combination]. Apart from the traditional cuisine, close to tourist spots in Macau, there are international restaurants serving delicious food from around the world. Also, when booking your hotel check the restaurants they have on the property, you will be surprised by the amount of renowned and international chefs cooking in Macau. We had a lovely dinner at the Bene Italian Restaurant, where I tried a beautiful twist of Italian pasta and Asian spices, and Rob had a mouthwatering lamb chop. For dessert we ordered the parmesan ice cream with hot strawberry soup, OMG… the flavors were from out of this world. If you like good food, book a table at The Manor restaurant at the St. Regis Macao Hotel. Good and fresh ingredients, a fusion of flavors and lovely service. Nothing is ordinary there, even their truffle french fries are to die for. These are some of the best things to do in Macau, attractions, hotels and restaurants that will make your trip there memorable. We did this itinerary in 3 days, 2 nights trip, and it was enough to visit the main tourist attractions in Macau, enjoy the hotel and play. Keep in mind that Macau is not only a casino city, it has a lot of history, and it’s the combination of this two worlds that make this unique part of China a great travel destination. Enjoy Macau tourist spots, play some games and taste delicious food. If you still have free days stretch your trip to Hong Kong, it’s worth it. Are you planning a trip to Macau? Have you been there? Leave your thoughts! Like it?! Pin it for later!! Wow! I hadn’t realized how neat Macau was. I personally would like to visit A-Ma Temple as I am fascinated by many old, historic temples after visiting Japan last year. The Sheraton hotel looks luxurious and my husband and I would love to stay there and follow in your footsteps. The A-Ma temple is very interesting, especially the contrasting architecture from the Portuguese square surrounding the Chinese Temple. I’m sure you guys will enjoy Macau a lot! As I read there are many nice things to do in Macau apart from the casinos and it looks like a nice town with beautiful architecture. What really caught my eye though is the amazing hotel bathroom! Wow! Macau is really nice indeed… But the hotel bathroom was stunning! Fascinating, I had no idea Macau had so much history! Great to know it’s so close to Hong Kong- I’ll definitely keep that in mind if I ever end up in the area. Many people think Macau is only a casino city, but actually it’s a really nice and beautiful town. Plan your trip to Hong Kong and leave at least two days to explore Macau. Macau was super fun, a great mix of history, relaxation and games! We didn’t manage to get there on our trip, but definitely a good excuse to head back that way one day! Looks like it’s worth a visit! You definitely need to go back, Becky! Macau is worth a visit. I am not a fan of casinos, but it looks to me like there are plenty of historical sites to take in such as the churches and temples. Those would keep me busy for a while. Very thorough and detailed guide you have put together on Macau! Definitely Macau is more than casinos. You can go there for a weekend getaway and have fun without even entering in one of the casinos… The city is plenty of places to visit and good food! I’ve long been curious about Macau. Now that it’s a two party system it will be interesting to see if it continues to flourish. Thanks for the detailed and interesting post. Macau is in a moment of full development and the number of tourists is growing every year. It’s definitely a good moment to visit the city. Macau was very interesting for us, especially for being able to read the Portuguese signs in the middle of Asia. Interesting and weird at the same time. What a beautiful bathroom! That place is definitely my style 🙂 Thanks for the suggestions. Happy travels! That bathroom was a dream, couldn’t get enough of it! Happy travels for you too! Every time I see photos of Macau, I can’t get over how much it looks like Las Vegas. I went to college and lived in Las Vegas for a number of years and I often miss it. So I think I’d really enjoy a visit to Macau! 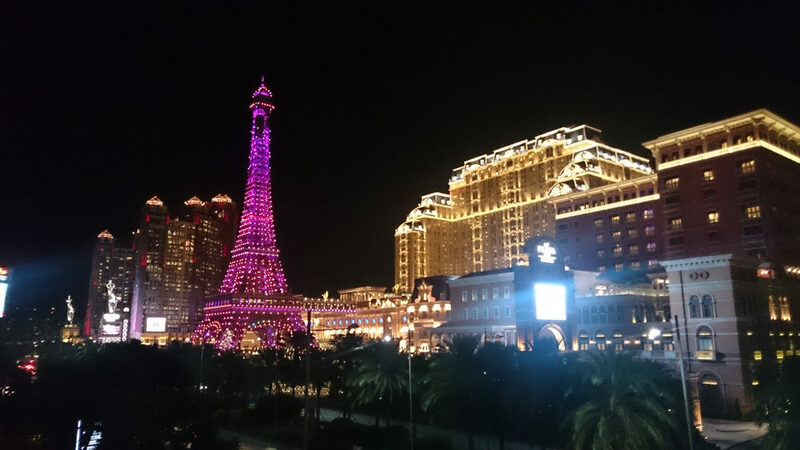 The Cotai Strip and all the lights do look like Las Vegas, but once you are in the historical town is completely different. I love your photos dear. Fantastic and inspiring! I have never been in Macau but I am convinced by your article. Should plan a trip there soon. Thank you for sharing useful information. 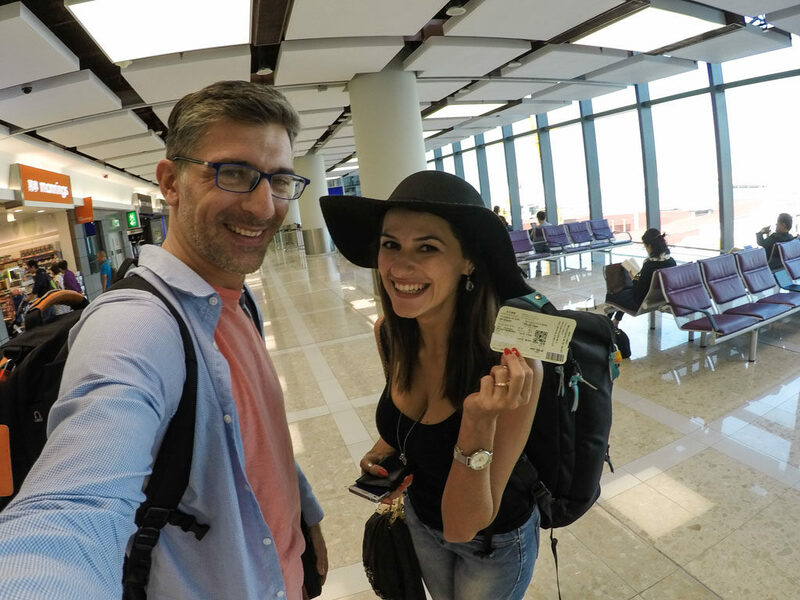 We loved our time in Macau!